OLDRIGHTIE: Osborne Says Eurozone Crisis Killing UK Recovery. Osborne Says Eurozone Crisis Killing UK Recovery. 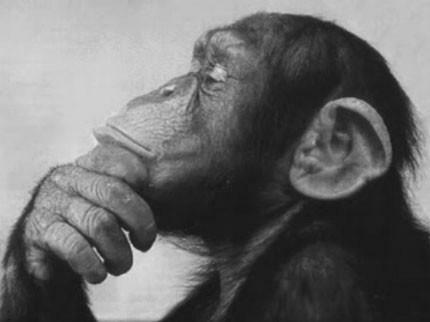 This primate has more intelligence and ability than all of the West's political incompetents put together. If for no other reason it is able to stop and bloody think. As Spain is set to receive untold riches for bailing out those banks who aided and abetted crooked developers to erect many hundreds of thousands of unwanted houses and development schemes, the great and brilliant UK Chancellor pronounces something he and his bent Civil Servant Mandarins have supported, regardless of the corrupt, crass, blind, narcissistic, federal cobble up, failed plans and deceitful schemes. Typical political stupidity to blame the sickness on symptoms and not the deep seated cancer that is destroying economies and lives. Note the constant blind eye to the history of failure dating back to "The Common Market" which in reality is a common nightmare of austerity and bankruptcy. As if the failed and bottomless pit of subsidy driven favouritism, such as the fishing quotas and agricultural policies are not sufficient to show the paucity of this ambition and political greed, we now witness the misery of Greece being allowed to "prosper" whilst the favoured and more feared Spain gets all it asks for to refill the depleted coffers of its bank vaults. Not one, not one, effort to track where all this wealth has been funnelled. As with the beginning of this explosion of reality as to how corrupt and despicable this EU monster is, back in 2007, so the perpetrators continue to flourish. Not only that but the political grip on it all slowly tightens the stranglehold by Merkel and her cronies in Brussels. 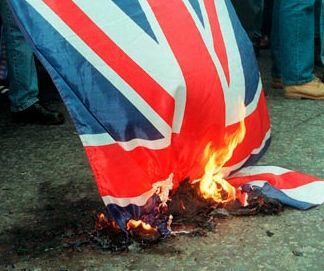 Throughout this whole scandalous evil our wee Boys in the UK street of once great leaders, mouth their frustrations. As though somehow their collusion and profligate failure to really put our UK house in order gives them a special power to lecture others and in particular the people of this European reluctant and bullied State. All of their deluded, mandarin induced rhetoric ignores the reality of it all. A Federal European State is the only deal on the table, as far as Merkel and her German cohorts desire. Not her people of course. However the one big problem is it is as expensive as their last attempt to rule by a conquering, military, regime. Here's the rub. They've secured the economic high ground for their hubristic desires but have run out of ammunition to hold it. The rest of the global superstate wannabes, from the USA and Mafia cartels, want a global dominance with a subjugated set of areas bowing to their demands. Herein lies a big problem. The money brokers for a global scheme have hit the same obstacles the EU has. Firstly it's much more expensive than realised. Secondly billions of "investment" has gone missing and so large is the gene pool of embezzlers, it's just too hard to find all of them. It's not for nothing The EU's accounts never get signed off. Do that and you identify the Barroso, Rompuy and others' within this merry band of thieves and vagabonds as complicit in the fraudulent misappropriations. One of their once dear friends, Berlusconi, stumbled out into the open and had to be quietly side lined to hush up this ghastly bunch of greed merchants' culpable activities. Regardless of all this crooked machination and desperate tail chasing, the enormity of the failure, dishonesty, lying and secretive nastiness, remains under the surface. Unfortunately for our lot and their cowardly collusion in the shambolic mess, all the torpedoes are locked into the submarine and primed to explode on board. A quick escape through the hatches seems not to be an option for our lot. I wonder why? The issue is very simple OR. The UK thought it was entering a free trade zone when it joined the EU. No one realized the overbearing bureaucratic monster the EU would turn into. Why the UK doesn't just consider an association with the EU that's out of the EU but allows for free trade, I'll never understand. T he EEA its called, its what Norway has with the EU. I don't understand why this option does not appear more widely in the news?? Hi, FI, thank you for your comments. "I don't understand why this option does not appear more widely in the news?". I believe the debate is stifled by the dead hand of our own Government as directed by the traitors in Whitehall and their pals in the media and BBC. FI..the UK public were kept in the dark by the true nature of the EEC. If you read the minutes from the meetings at the time this wasn't the case with Ted Heath who knew the true nature of the EEC. Eventual fiscal and political union in a Federal Europe. Heath's biography admitted the same and he said he would never have got away with it without Queenie's rubber stamp and if it wasn't kept secret from the people. I notice Ken Clarke was at this yrs Bilderberg meeting so don't expect any change from the Tories. They have their new orders. Bob, I am forever astounded how these lies go unpunished. The Mandarins continue their secretive rule regardless of the muppets in Westminster.